It seems this year, the election will be about who can slam Harrisburg harder. "I think I can sum up the motivating factors why I'm running for state representative with three specific things," said Jason Owen, Republican candidate for State House District 3 in his opening statement during last week's debate. "One is the 814 area code split. Two is the redistricting issue. And three, the cuts to the Flagship Niagara. "Those are three things I have found pretty repugnant, and they represent a true and utter lack of leadership in Harrisburg." Minutes later, Owen's Republican opponent for the legislative seat, Regina Smith, in her own opening statement, chimed in: "I see what goes on in Harrisburg, and I'm dissatisfied." And there, at the opening bell of the Erie Reader's 2012 Downtown Debate Series, was the main theme that would crop up again and again Wednesday night, when Owen and Smith debated, and again on Friday, when the Democrats vying for the 49th State Senate District seat -- Brian Pitzer, Terry Scutella, Sean Wiley, and John Harkins -- faced off: a strong anti-Harrisburg tone. Dissatisfaction with both the Republican-led assembly and the state's Republican governor was on full display. Of course, what and how that slamming is expressed defines the differences between the candidates. The Republican House candidates -- Smith and Owen -- seemed to fault the state government for not living up enough to conservative ideals of limited government and pragmatic leadership. Owen, especially, who touted his libertarian ideals, found fault with Pennsylvania government on a number of issues, including the possible privatization of the Pennsylvania Liquor Control Board, asking rhetorically, "should the state be selling liquor?" replying, "I don't see any argument why the state should be involved in that business," noting that Erie "needs someone who is a strong leader in Harrisburg" to help push the issue through. Redistricting brought out Owen's ire. "There are so many ways to do redistricting better," said Owen, "I think anyone is going to be better than the current system." Owen called the current redistricting system "politicized" and "partisan," faulting the legislature especially for creating a House district that stretches from Pittsburgh's suburbs to Lake Erie. "There needs to be geographic and regional representation involved in the process," he said. "There is no commonality in that district." "That shows a failure of leadership." Smith, on the other hand, referred to her work as current State Senator Jane Earll's community and economic development director, and herself as the more experienced candidate. Her interests lay in creating a "business-friendly environment" for Erie, and in creating jobs and developing the local workforce, and her approach to issues reflected an insider's view, as she proposed patient, conciliatory approaches to problems. On privatization of the PLCB, for example, Smith noted "we've moved beyond the time" of the original intent of the board, and it's "time to start having that conversation" about moving towards privatization. On education Smith noted, "we have been increasing funding for education more than the consumer price index every year, and the kids aren't getting smarter. Money isn't the answer." And she said that the answer was too complicated to give in a one-minute sound byte. That kind of language fits in with the depiction of herself as someone with insider knowledge who'll "hit the ground running." She promised she knows how Harrisburg works and will help mitigate Erie's problems with political savvy. The Democrats running for the 49th State Senate District seat, on the other hand, did not at all feel shy about expressing their outright distaste for Governor Tom Corbett's policies -- especially when it comes to budget policy. Terry Scutella -- a former telephone lineman and Pennsylvania Department of Revenue collections agent and current member of the Millcreek school board -- said in his introduction that he hoped the debates would touch on the variety of cuts made by the state. But it was really on a question about the ever-growing prison population and incarceration rate that brought out the long knives for the governor. 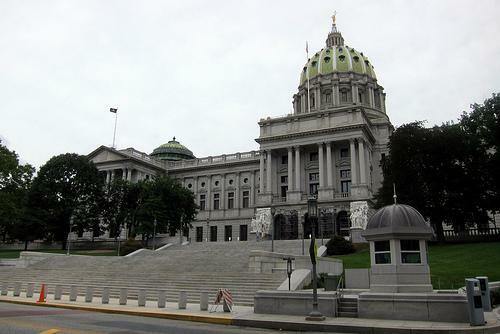 "The focus of the government in Pennsylvania has been on incarceration," said former director of marketing and public relations of Edinboro University of Pennsylvania Brian Pitzer. "We're paying money to put people in jail instead of paying money to educate them, and that's just wrong." Pitzer also asked the audience during his introductory comments to remember him as "Brian the Bridge Builder," because of his campaign platform to bring jobs and revenue to the area by fixing the structurally deficient bridges in Erie County -- lambasting the state for having the highest rate of unsound bridges in the country. Erie School Board Director John Harkins was even blunter. "One of the biggest economic engines in the state of Pennsylvania," he said, "is the prison system." Again, as during his introductory comments and in answer to at least one previous question, Harkins emphasized how critical education is to Erie. "Education is the best weapon against young people finding themselves in the prison system," he said. "The governor wraps himself in a cloak of law and order, and his emphasis is that the money gets spent there. "He's comfortable capitalizing on fear." "One key way -- the only key way -- to get yourself out of poverty is through education," said Sean Wiley, echoing Harkins, "and when this administration chooses to make drastic cuts -- slashing education -- and bolstering the budget on incarceration, it's clear we're missing something." "We have to identify additional forms of revenue for the state," he said, "it's not just about making systemic cuts. Pennsylvania is the only major gas-producing state that does not tax natural gas based on volume. That amounts to $200 to $400 million to the state. "You can definitely fund the first line of protection -- and that is the [Department of Environmental Protection] in this situation -- you can continue to fund our quality education. You can continue to fund our public safety arena, you can continue to not cut 400 or 500 state troopers. You can do that through a lot of these revenue opportunities." And while these debates presage the primary and were intended to aid you in making a choice this coming week at the polls -- vote on Tuesday, people! -- really, what's taking form here is the shape of the general election debate. It's obvious that the candidates -- and likely the people who talk with them every day -- feel that Erie and the region is being woefully and inadequately represented in Harrisburg. The debate then will center on not only which style will most greatly aid in winning better representation, but also what that good representation should look like. Hint: It does not look like Tom Corbett.